Six months later, NHL player Spencer Corbett is astonished when Maggie shows up on his doorstep demanding her dog back. He’d found the pug on the side of the road, collarless and in bad shape. But even when confronted with hard evidence she’s the dog’s owner, he begs her to reconsider. His own elderly dog is on her last legs and Kirby has given her a new lease on life. Animal Attraction may be read and enjoyed as a standalone sports romance! 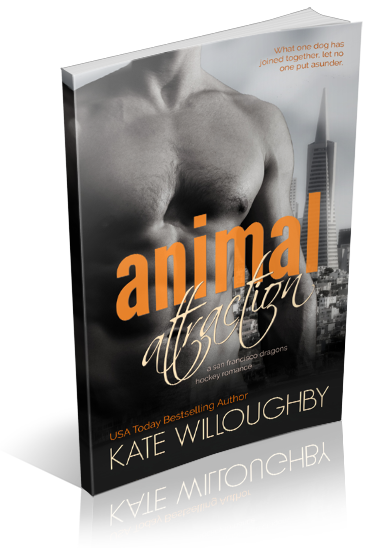 I am organizing a release week blitz for Animal Attraction by Kate Willoughby, an 18+ Sports Romance novel. The blitz will run from April 27th to May 3rd, 2019, you can post on any day during this window. There will be excerpts available for your post, and every participant will be able to post the blitz-wide giveaway if you wish – giveaway prize(s) courtesy of author. Social media sites are welcome. An email with the complete post info including promo items and giveaway details will be sent to all participants on April 23rd.